Manipal Hospital, situated on Airport Road, Bangalore is a landmark destination for quality and affordable healthcare. 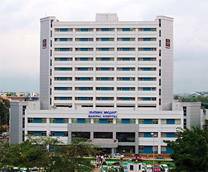 The 600 bed centrally air-conditioned hospital is the first tertiary care multi superspeciality referral centre in Karnataka. It is India’s first hospital to be ISO 9001:2000 certified for Clinical, Nursing, Diagnostics and Allied Areas. The hospital has been declared winner of the prestigious Golden Peacock National Quality Award 2005 in the service category. With a team of some of the best doctors in the world, an attentive staff, state-of-the-art equipment, the hospital provides specialized medical services at affordable costs in over 40 specialties.